7 Amazing Kumarakom Houseboat Packages You have never considered ! 07 AMAZING KUMARAKOM HOUSEBOAT PACKAGES YOU’VE NEVER CONSIDERED, AND WHY YOU REALLY SHOULD! With more and more split opinions people opting for long-haul short breaks to backwater touring destinations such as the Alleppey, Astamudi and Nileshwar, it’s easy to overlook Kumarakom as a backwater hub. However, there are many hidden gems in Kumarakom which are all too often overlooked by tourists with its diverse kumarakom houseboat packages. Since houseboat packages are available at about 10 lakes statewide and many offer all the creature comforts of a hotel, they’re a great option for exploring watery parts unheard of with ultimate cruise experience, But to experience backwaters profoundly one should undertake a Kumarakom Houseboat packages. That if you do decide to visit, you will get the chance to get away from the crowds! Here are our ultimate backwater cruise options on Kumarakom Houseboat packages you’ve never Considered, and why we think you really Should! Want to know more about : 7 Astounding Backwaters of Kerala ! While choosing Kumarakom Houseboat packages Day Cruise is one of the good ways to explore and experience the backwater beauty. Prepare yourself to be fascinated and mesmerized with the unique beauty of the backwaters, lagoons, canals & tributaries. Starting from Kavanattinkara, which traces its history to the 16th century, your all day cruise commences onboard one of a kind traditional Kumarakom houseboat that adds to the rustic feel of this experience. Kumarakom Houseboats are best examples of responsible tourism are locally crafted in wood with thatched roofs from Baboo peels & coir. While on your houseboat ride catch the glimpses of the nearby villages, temples, churches and farms that help you get a clear picture of the simple yet beautiful life of local folks. You can witness the beauty of the paddy fields, coconut lagoons it will be a mind-blowing and memorable experience. The normal timing for day cruise is from 11:00 am to 05:00 which can be customized according to the convenience of traveler. One should not miss it if presented with an opportunity to experience this aboard a Kumarakom Houseboat. No two Kumarakom houseboats are quite the same. So, this is an activity where you look at various options available before you decide on the Kumarakom houseboat package. This Kumarakom Houseboat packages includes a variety of options to pick from in terms of the boats and other services. The check in time for the Houseboats is sharp at 12 noon. The Kumarakom houseboats begins the journey by meandering through the various canals and give an opportunity for the tourists to tang the traditions and customs of the Backwater life which is often described, ‘Rustic’. The virgin landscapes, fine ravines and winding canals which are dotted with the presence of the beautiful looking bunch of hamlets provides a visual treat to the onlookers. In the Kumarakom Houseboat during the break which usually stretches to an hour, the freshly cooked Indian cuisines particularly the authentic Kumarakom backwater cuisines are served. As the cruise progresses the time the tea time will be made merry by serving you hot masala tea & steamed savories. After 6 hours of backwater lakescape discovery the engine of Kumarkom houseboats are stopped and will berth to a quaint spot some were near the Vembanad Lake or near to backwater villages. Once Houseboats are halted it’s time to explore the backwater landscape. During the dinner time one is at liberty to choose from other other non-Indian cuisines. To lift up the spirits, the chilled beer is also served aboard Kumarakom Houseboat packages. After this, one can enjoy a deep slumber and wake up in the morning to glance through the charismatic rising of the sun followed by a scrumptious breakfast. Further Houseboats sets sail & cruises for an hour and reaches the jetty to see off you. Please demand the : 12 Basic Things Every Houseboats In Kerala Backwaters Must Offer ! With so much to plan for your wedding, the last thing you want to do is stress out about your honeymoon. Kumarakom Houseboat packages make excellent honeymoons because they combine pampering with cruise — the vacation is in the backwaters and onboard Houseboats. After all, Houseboats have spas, local-chef restaurants, culinary classes, butlers and swanky lounges, plus the Backwaters as your backdrop. Kumarakom Honeymoon Houseboat appeals to honeymooners seeking extra personal attention and a more intimate onboard atmosphere. Backwater Routes gives them the opportunity to make it the best voyage alongside the coconut groves on the banks. Kumarakom houseboat packages gifts the newlywed with an experience of being at the best heart spot of birds and enjoying every bit of the lagoons.The cool breeze, mesmerizing sunset, piping hot tea and delectable local snacks would give you company as you get lost in the moment and share unadulterated bliss with each other. 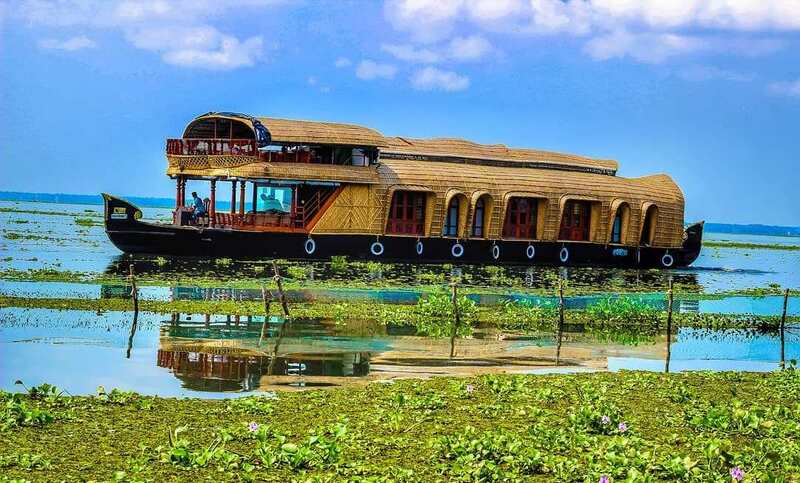 Plus, the Kumarakom Houseboats port-intensive itineraries offer occasional overnights in destinations, permitting you to immerse yourself more in the local culture or have romantic dinners on exotic resorts ashore. In addition, wine is included with meals, all cabins are adorned with fresh flowers and suite passengers benefit from the service of English-trained butlers. And, with service gratuities (as well as many beverages and shuttle buses into town) included in the cost of the cruise, you can focus more on enjoying the trip than crunching numbers. Romantic extras: Backwater Routes does not offer specially designated honeymoon packages, but you can take advantage of the complimentary services of a concierge to plan your own surprises, or create a customized experience in advance with spa appointments, specialty dining reservations with private tables for two or breakfast in bed. Backwater Routes two honeymoon special Houseboats, Honeymoon castle & Water Villa which could limit your selection. Standard cabins, while cozy, tend to be smaller than typical luxury yatch rooms. Best Itineraries of voyages in Kumarakom backwater and along the Kottayam and Meenachil rivieras are excellent choices, not only because of the destinations they visit but also because of the unique array of ashore excursions. This private cruise with most of worldly pleasure is a must when rekindling the romantic spark is on top of the agenda. A Sunset Dinner Cruise is an indelibly distinct episode on backwaters that can be the highlight of your Kerala vacation. Away from the hectic pace of life, tiring activities, nightmarish noises of traffic and hurly-burly of the city, the cruise offers a pleasant distraction for you and your loved ones to relax and unwind in. The creeks, lagoons & vast expanses of Vembandu Lake makes for an enchanting venue where you can enjoy the magnificent allure of the sunset while basking in the comfort of our stately Kumarakom Houseboat. The three-hour long outlandish backwater cruise pampers your senses with a grand view of the largest lake of Kerala the Vemabandu . Nowhere else can you experience fine moon lit dining & wining, dancing and good old fashion merry-making than on this beautiful ship. Enjoy the beautiful hues the sun casts out on horizon, The Lakeview, which is the houseboat’s open deck that often hosts activities such as unforgettable weddings, parties, reception, etc.. Impressive corporate activities such as conferences, summits, seminars, exhibitions and mini- business meetings can also be hosted on board. Your sunset dinner cruise has exclusive boarding and de-boarding points from our private jetties located in Kumarakom, Kavanttinkara, Cheepunkal, Kaipuzhamuttu & Vechoor. Welcome drinks, snacks and buffet dinner are all included in this package. Why opt for Houseboat half day trip when you have day cruise to night stay options ? There are folks who are not lucky as you who happened to have reached Kumarakom as part of convention, Official meeting etc, So what options do they have to the feel of backwater culture that radiates across the landscape of Kumarakom. Google acclaims the coast, lined with swayed coconut palms, stretching beside the landscape to emerald waters is paradise for Half day cruises. Those who are short of time, who had to move on to next destination and those who made a stop over at Kumarakom en-route are devotee of Kumarakom Houseboat half day trip. Picking Kumarakom Houseboat packages Half day trip is one of the good ways to explore and experience the backwater grace. Every single moment spent aboard Houseboat on Kumarkom backwaters is to cherish. The balmy breeze rues through your hair, soothes your body and the rolling waters awaken your soul as get mesmerized with palm fringed verdant backwater coastline. There are is bigger chance that you may extend your Kumarakom backwater cruise by another two or more hours alluring grandeur of this spot. There is no specified timing for these Kumarakom Houseboat packages and is mostly on-demand & for better experience prior booking is advised. Half Day Cruise can be commenced any time between 09:00 am to 05:00 pm which can be customized according to the convenience of guest. Wanderers, Explorers should not miss the Kumarakom Houseboat half day trip if any opportunity at one’s disposal. 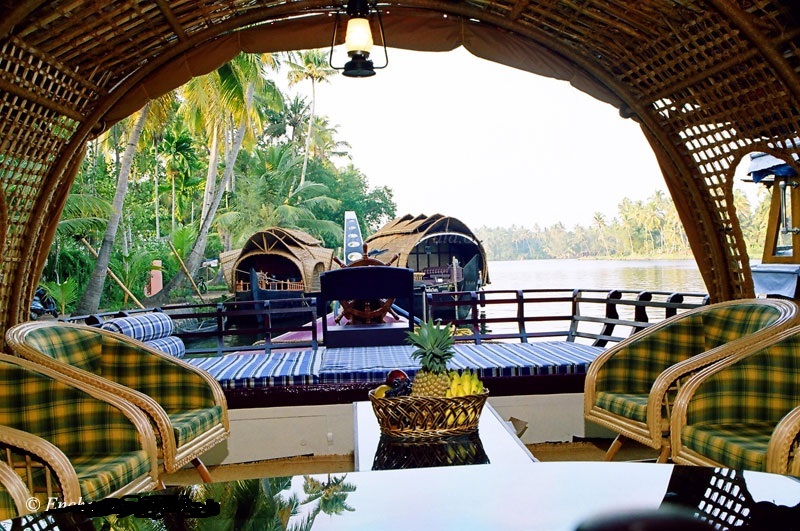 No two Kumarakom houseboats are quite the same. So, this is an activity where you look at various options available before you decide on the Kumarakom houseboat packages. If nature’s pampering is all you need to rejuvenate, Kumarakom is indisputably one of the most invigorating and fascinating places to unwind in the great backwaters. The slender coconut palms standing here, there and everywhere, its never ending paddy fields, meandering lagoons and backwaters and mangroves with nestling birds of a hundred varieties will all serve to calm and inspire your mind. 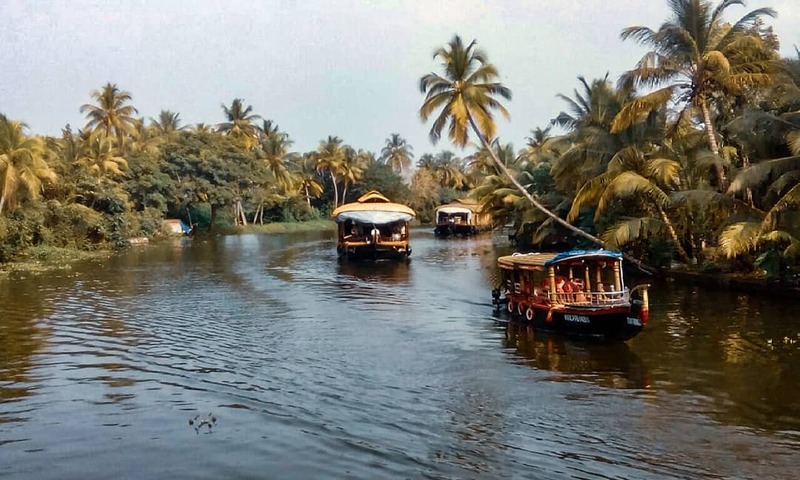 Cruising the scenic landscapes of Kumarakom and it’s many interlinked canals through the sublime backwaters of Kumarakom on a houseboat is the best activity one can embark on. Aboard houseboat kick back and relax as you’re taken around the calm waters, where you are absorbed into the enthralling beauty of canals of Kumarakom. Tiny waves fluttering in the breeze, fishermen venturing out for a catch in small punting boats, traditional hamlets and its never ending paddy fields, you would be drifting into the world of a different kind altogether. The innocent villagers and their life along with water is another unforgettable scene which will undoubtedly tempt you for more canal cruise. Kumarakom with its majestic canals, streams and tributaries along its banks weave an intricate and enchantingly beautiful web of waterways. The gorgeous green of the fringed palms ripple in the blue waters and blend into wavelets would be rare sights you can cherish. The whole atmosphere spells peace, bliss and tranquility. The enchanting moments that you spend on canals of Kumarakom will certainly linger in your minds forever. One has to experience this in the lifetime, your mind will whisper undoubtedly as the houseboat cruises kissing past the waves. Kumarakom Houseboat holidays on Backwaters of Kumarakom & adjacent Alleppey & Vaikom Backwaters are quite unlike any other experience. Both in the variety of the surroundings and in actually having time to look at them, Kumarakom Houseboat Holidays provides an escape from the rush and monotony of ordinary life. But there is also an enchantment at work while aboard . Sometimes it is the looking glass magic of familiar scenes viewed from a new angle and in a different light – these are the rural stretches, the green carpeted paddy fields in the midst of lake with the curious strokes searching for prey, the swans bringing their dignified selves to accept your bits of bread, the ducks who loudly demand the same, the endless variety of mangroves and never go straight coconut palms, of flying and swimming and scuttling backwater life. Kumarakom houseboats, adapted from the old Kettuvallams, are floating hotels designed to take care of all your backwater holiday needs. An experience that is both indulgent and memorable. 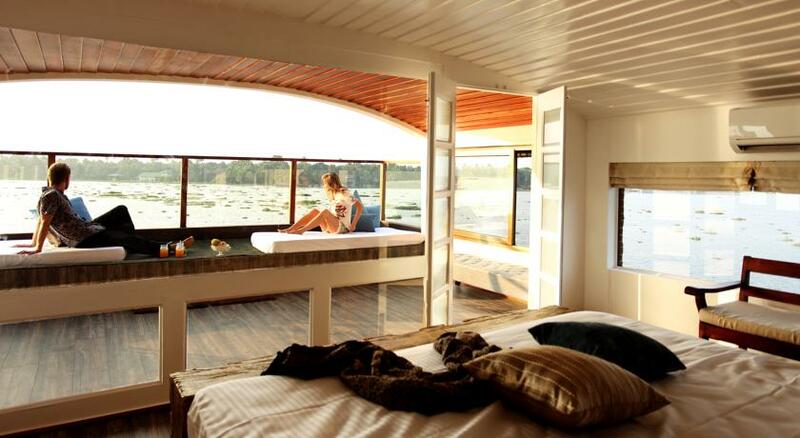 Houseboat bedroom cabins in particular are comfortable spaces to relax or rest deeply. Kumarakom Houseboats provide both privacy and protection from insects and the elements while keeping you intimately connected to nature around. Your sleep will be gilded with the rhythmic cries of cicadas on the shore and the gentle lapping of water against the sides of your floating bedroom as it weighs anchor at night at the lake’s centre, awaiting dawn. Throughout your stay, no one will infringe into your privacy or try any hard-sell tourist techniques. Partly, it’s because this area is off the beaten tourist track. It is also a fairly prosperous pocket of Kerala bolstered not just by abundant crops like, paddy, mussels, shrimps and coconuts & foreign remittances. Vembanad, Punnamad & Ashtamudi Lake are in which Mother Nature has gone all out and ornamented herself with serene lakes, lazy rivers and swaying palm trees. It is truly a paradise on Earth, with charming native and exotic traditions. A backwater holidays cruising along the backwaters on a houseboat, is a magical experience to cherish. Interested parties can, check out 07 Houseboats in Kumarakom Backwaters for Unmarried couples !